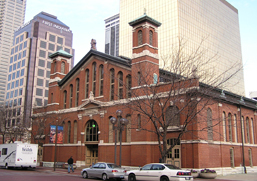 City Market has the singular importance of serving as the main public market for Indianapolis for over 120 years. Its brick architecture reflects the German training of architect D. A. Bohlen. Alexander Ralston set aside this site for a market in his 1821 plan. The city built several simple market stall buildings here early on. In 1886, architects D.A. Bohlen & Son drafted plans to replace the aging market sheds. This is the building that survives today, with alterations. The brick exterior walls have stone sills and details. The Market Street side is the original main front. Here, Bohlen used twin flanking towers, simple pilasters, and stilted round arches. Similar to the Romanesque Revival style, but coming from German sources, historians call this style Rundbogenstil or Round-arched style. D.A. Bohlen was trained in Germany at the height of influence of this bold, utilitarian style. The architects also planned for a clerestory to infuse additional light to the interior. For the interior, the Bohlens made use of cast and wrought iron columns and trusses to support the large free span needed for the market stalls. Hetherington & Berner iron works of Indianapolis provided the iron work for the interior. In 1972-77, the city completed a massive revitalization of City Market. Over the years, the Bohlen firm had designed additional bays to expand the building. These were removed, and the firm of James & Associates designed modern wings. A mezzanine was added to the interior of the 1886 building. The plaza to the west of City Market once housed Tomlinson Hall, a large red brick building similar in style to City Market, also designed by D.A. Bohlen & Son in the 1880s. A fire damaged Tomlinson Hall, and it was demolished in 1958. The remnant arch of Tomlinson Hall was discovered during the 1970s rehabilitation of City Market. Recently, City Market has undergone another major renovation and development project. City Market is located downtown at 222 East Market Street. The market is open business hours plus Saturday mornings. The Indianapolis City Market website has more information. Recommended: Breakfast and lunch stands have everything from Irish (stuffed potatoes) to Italian, Middle Eastern/Greek, and American cuisine. Gourmet foodstuffs are for sale as well. Also, the adjoining plaza often has live entertainment in season. Farmers Market is held each Wednesday, May-September. City Market is a must-see.